It was a little unexpected for me. I had gotten the idea somewhere that Alice Hoffman wrote stuffy books that I wouldn’t like, and then I was looking for a book to fill the “A Book your favourite author loves” slot in my 2016 Reading Challenge and I came across this article, about five of Dean Koontz’s favourites, and I was drawn to the description of this book. I figured why not? I trust Koontz, he created one of my favourite serial fiction characters of all time (Odd Thomas). I’ll give it a go. The Museum of Extraordinary Things exists in the world of early 20th century Coney Island, and is a museum of curiosities, with live acts that are essentially a freak show of the era, though the proprietor – the father of the main character – tries to elevate that a bit. Coralie – the daughter – feels like a bit of an outsider herself, born with a deformity that sets her apart from the rest of the world. She lives her life isolated from society, with only a housekeeper and the people in her father’s employ for company. The housekeeper, by the by, is one of the extraordinary little side characters that has an amazing story of her own. On the other side of the island, Eddie – a Jewish immigrant – is struggling to find his own place in the world. Is it as a tailor, at the side of his father, working 16 hours a day to scrape by in poverty? Is it working for a con artist from his neighborhood who stands out from the rest? Or is it somewhere else, seeking his own vision of beauty and truth through the lens of art? When they come together, it’s absolutely magical. I love the relationship here, because it’s nothing like an ordinary love story. I adore the characters, and even the ones that are designed to be hated are so exquisitely drawn that they are remarkable. 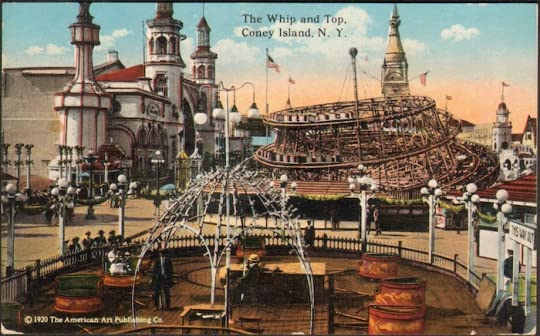 I love the history that is presented, through fantastic research, of the history of Coney Island and its tangled and twisted history. Best of all, I love the writing style of the author, who not only tells a story with glorious aplomb, but builds phrases with the delicate and sure touch of an artist. Truly, truly a beautiful novel that I highly recommend for those interested in historical fiction, or just want to read a piece of fiction that will move their heart in unexpected ways. Who thought a giant tortoise would get me all emotional? The first half does have some slow moments, but the ending is worth it – it gets very fast paced in the last third of the book or so!